Kinclaven was a parish in the Old County of Perthshire until 1975.
and was an administrative unit in Scotland for many centuries. We have no ancestral connection with the parish but it is a place, dear to our hearts: where we have lived, worked and been involved with the community and church congregation over the last few decades. 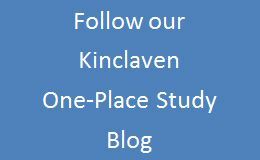 Encouraged by the newly launched Society for One Place Studies, we decided to share with you what we have discovered about Kinclaven. We hope that by spending time discovering and publishing all the local valuable resources we can find for one parish in Scotland, we can provide information to many researchers across the globe. The project aims to record, transcribe, or extract name, place and other historical information from a variety of sources which is Kinclaven related. From September 2013 to December 2013 Old Scottish Kinclaven research will involve the following record sets. Scottish Statutory Registers (SR) of Births, Death & Marriages (from 1855). We hope to have full details from over 2000 SRs by the end of September. We would ask that lookup enquiries be made using the form on the right hand side please. This is a new project and we shall endeavour to provide monthly updates in our blog about the information that we have published or discovered.